When you hear 'Canta y sé feliz' ('Sing and be happy') it's hard to believe this song was performed on the same night as the winning song of the 1974 Eurovision Song Contest, 'Waterloo' by Abba. But it's exactly what happend: Pedro Pubill Calaf, a.k.a. Peret represented Spain with this song. What's more, the Spanish Catalan Romaní gypsy singer finished in third position in the Contest, behind Abba (for Sweden) and Olivia Newton-John (for the United Kingdom). 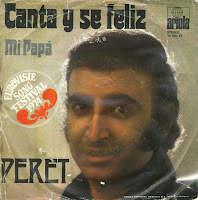 While Abba and Newton-John became international stars, Peret was mainly known in Spain for the rest of his career.